When the last person (iPhone) is leaving the house I want the alarm to be triggered automatically with a notification "You alarm is now activated". If a door/window is open I wanted a notification saying "Oops x device is open" and then have the option "Do you want to leave it open YES/NO". This is not necessary but maybe I want to leave a window or back door open, but the rest armed. If it can't be done it's ok.
Now if an sensor is activated I just get notifications and it's not all the time I can hear or see them. Is there a way to make a special sound on the phone if the alarm goes of? I know I ask a lot but to start I just want the basics to work so the alarm is triggered when we both leave the house. I attach what I tried so far but it doesn't work. The alarm is not triggered when we leave the house. I don't mind to pay if somebody can help me to set it up via TeamViewer. I see you already use Heimdall, but not in the way it is designed. I suggest reading at least the opening post in the Heimdall topic. Thanks. Anyway I could pay for your help to set it up? I have so much work and other family issues now so even if I want to learn (which I will in the future) I want the alarm setup a.s.a.p. Isn`t the most exiting part of Domotica, to learn and design your own setup?? with a bit help of the Forum/Slack. Its a learning curve, every day you find out stuf got ideas and then try and error....en after sometime you got more and more well know with making flows ect. And then when someone comes over to your house, you be a proud person to tell them what you accomplished. its a different feeling, when you have to tell them thats nice but someone else did it for you. "Thanks. Anyway I could pay for your help to set it up? I have so much work and other family issues now so even if I want to learn (which I will in the future) I want the alarm setup a.s.a.p." Your first flow is setup that the alarm will only be armed if you left the house and left a window open. So remove the contactalarm card in the “and” column and the heimdall app should ask you if the survailance should be armed. if last person left, then send a message “nobody is home”. That way you know for sure homey detects when the last person has left. Ps. I am still looking for a pro that can do the setup 100% correctly. Is there any other place where Homey professionals sell their services? Ds. You can disable a flow by rightclicking it in the floweditor and select disable. Your second motion sensor is working the same as your first sensor because in your flow you use the global “a sensor” card without defining a zone. Any motion sensor you add will respond to your flow unless you add a “is exactly” condition card in the AND column. 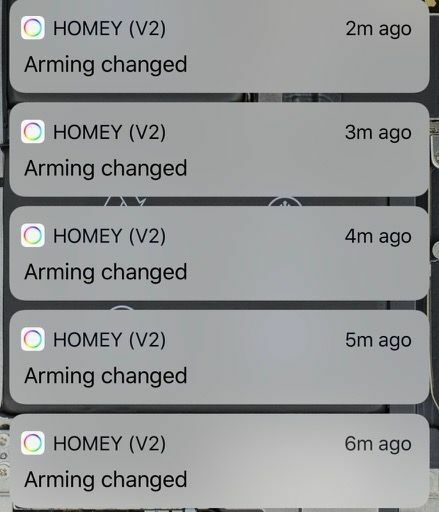 You can use either homeys own logic cards or the better logic app for this. Drag the zone tag from the IF column on to the “is exactly” card and define the zone your sensor is in (i.e entrance, hallway etc). 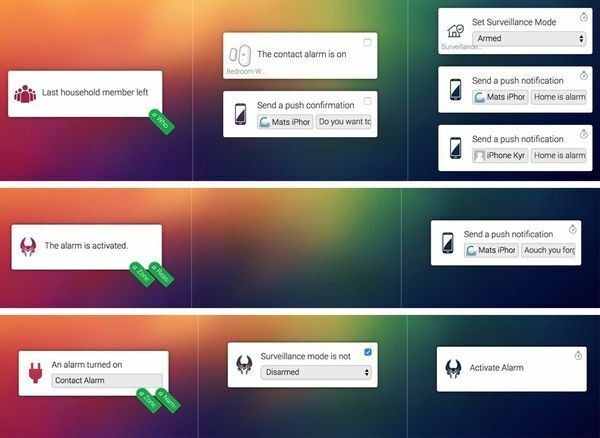 As for your alarm setup, you really should read the heimdall thread (top to bottom) as I think it will make everything clear as to how you should use the app in flows. Also the settings page of the heimdall app has a “how to use” section. I think if you give yourself an hour, read the thread and maybe even watch some videos on the supportpage, the penny will drop and you’ll be up and running in no time. 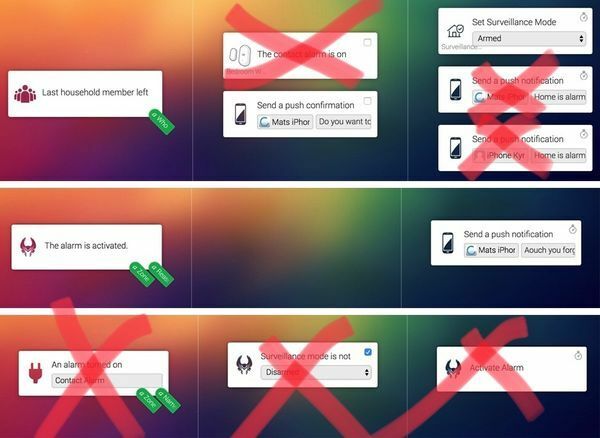 change your first flow to resemble the screen grab and delete your third flow. Ok thanks. But I can't really figure out Heimdall yet as I have 2 Xiaomi door sensors with different names and zones. One in bed room and one in living room. So in short, can I only add zones and not unique sensors and how do I add them in Heimdall? I am thinking to delete Heimdall and Smart Precense to start all over again as it might all be in a mess now. I guess this is all the help I can give you from my current location without a laptop. You could off course delete the heimdall app but I’m not seeing how you could accomplish what you are trying to achieve with smart presence. 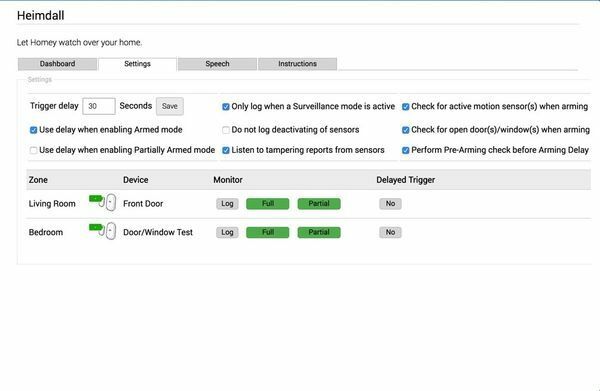 Smart presence has the same functionality as homey’s own presence detection, detect if you are home or not. That’s it. Anyway good luck with setting things up. And sorry if I sound like a broken record but, read the instruction page of the heimdall app. It tells you step by step what you need to get a working alarm setup. Sorry if I seem ignorant but I really mean what I say when I have family problems and really not feel to do anything than my absolute musts and take care of my family now. Therefore I also sound like a broken record that in this case I am looking for an expert to help me hands on. But respect and thanks to you Moek trying to help. I followed your image with description and this is what it looks like now. I didn't have a chance to try it really yet as it's late here. But is this supposed to activate the alarm when the last iPhones leaves from home and will it disarm when the first phone comes back? I can see now when making a test that I get a notification that I "You have an window or door open" and I have to say Yes or No. So does that also mean I can chose to leave something opened as I wanted? You don’t seem ignorant @Matsaki and I’m a family man myself so I understand where you’re coming from 😉. I just think that you should start out basic and build on that. 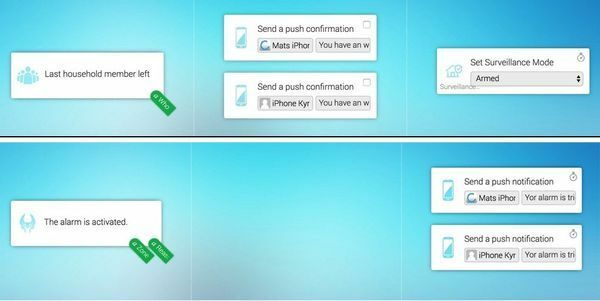 That’s why I think you should first follow the basic flows on the instruction page of the heimdall app. Also, for now, skip the open window part and just make sure it’s closed when you leave the house. It will make understanding how flows work much easier. I would first delete both cards in the AND colomn because that’s where things start to go wrong. You’re using the cards the wrong way. The way it is now is that 2 persons have to confirm that a window is open to let the flow be executed and arm the survailance. If one of you don’t respond to the message the flow stops. If one says yes and the other one says no the flow stops. And if you both say no it also stops. You can expand the OR column by clicking at the bottom of the AND column. The second flow is almost ok. Note that alarm is not the same as survailance. 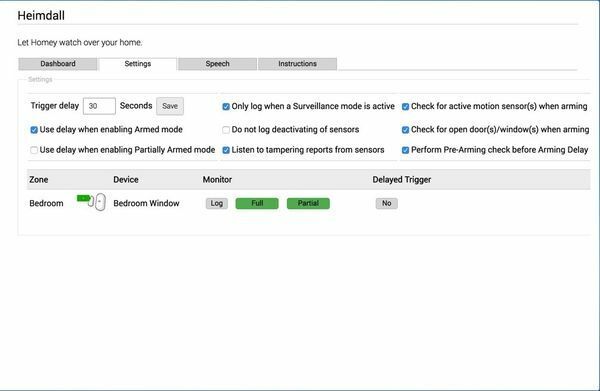 The alarm gets activated when survailance is armed and a sensor gets activated. Hope this helps and good luck with the family! But hey, at least something’s happening now right? Aouch that was news to me? Anyway, I installed the official app. but the notifications keps coming. Not so bad to have both apps installed is it? Just use v2 for everything. V1 is just there for presence. I guess your notifications come from some old flow which is not disabled? Yes me too and my guess is everyone else is too 😉. I was talking about “manually” switching a light or start a light preset for instance with the app.